Hi, I am Jim Lu ckett, co-owner of SailboatsToGo LLC. 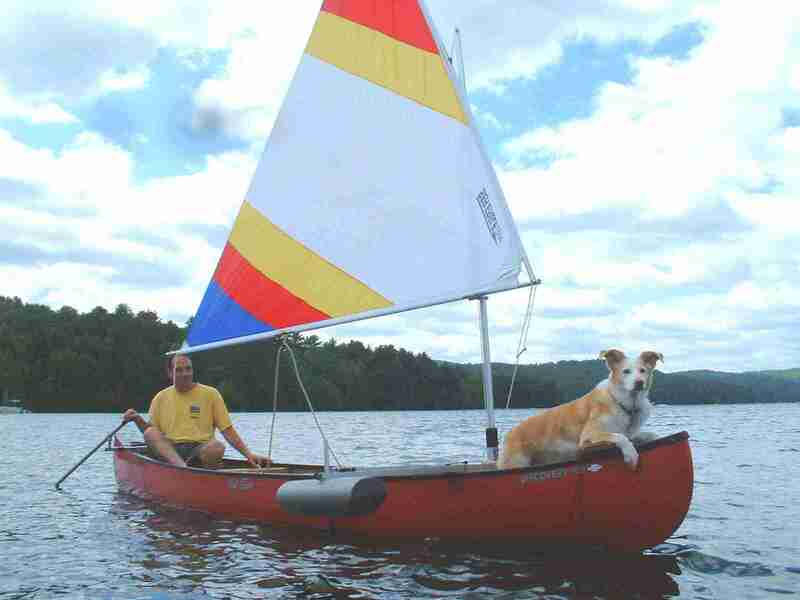 This website is about putting you and your playmates into the most convenient, comfortable and fun little sailboats on the market. If you want to skip this and go right to our on-line catalog click here. Any text you see here in color is also a link you can click on. I looked at and rented Sunfish -- Too Heavy on land and it's strictly bathing-suit sailing, which is no good in early Spring or in Fall. I owned a Super Snark. It was a blast. 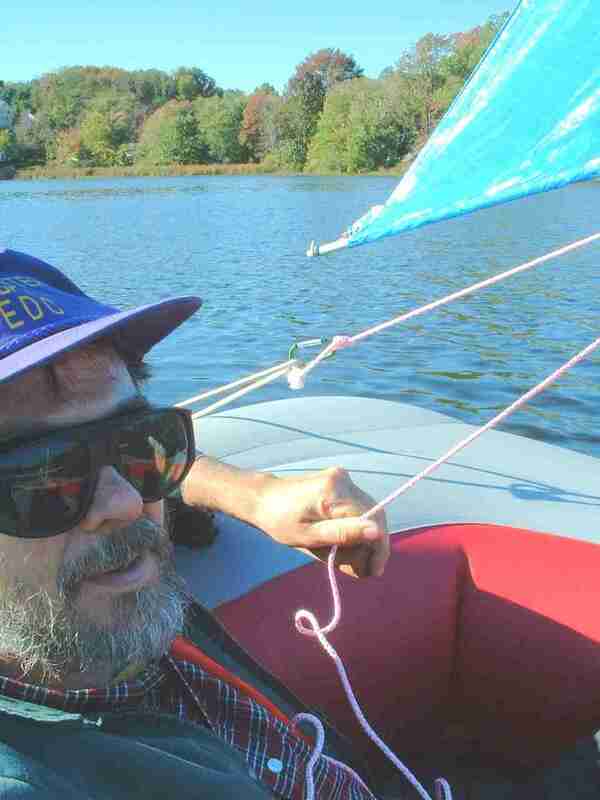 The Super Snark or Sunflower can be a great solution for portable sailing if you don't mind the lack of creature comforts and you have a way to store it under cover. See them here. I built a plywood sailboat. Too heavy and it required a trailer, and annual maintenance, and was not comfortable. I looked at and rented the Escape. Too heavy. Trailer required. Not comfortable, not dry. At last I bought a sail rig for my canoe. FABULOUS! Roomy, lightweight, dry, comfy, fun to sail. So great, that I wanted to bring the sail rig with me on vacations to the Caribbean. But there are no canoes to rent in the Caribbean. So I tried a Sevylor sail rig on a Caravelle inflatable raft. Took it in my luggage on the airplane. GREAT CONCEPT, poor execution. So, I junked the Sevylor rig and started from scratch with the Sevylor hull, some parts from my canoe sail rig and some ingenuity. 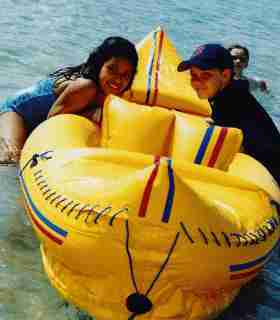 The resulting inflatable sailboat worked so well I was surprised, delighted and eager to share it with the world. 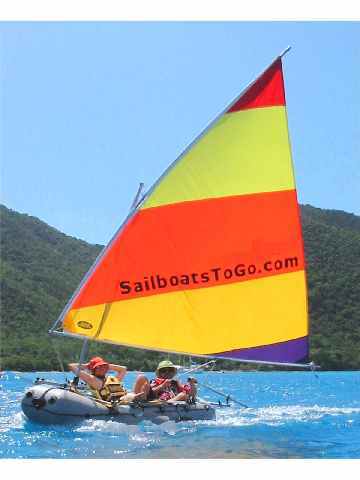 SailboatsToGo was born, selling my rig for inflatable dinghies, as well as canoe and kayak sail rigs along with other boating accessories. You can trust SailboatsToGo. I am a boating enthusiast like you, and I'm not happy if you're not happy. Here's my home phone: 978-263-7598 and email Jim@SailboatsToGo.com . Call me (up to 9 PM Eastern time) or email me and let's get acquainted and see what if any sail rig is right for you. No pressure, I promise. The only sales I want are ones where the buyer is truly happy and comfortable with their purchase. I have another successful line of work for actually putting bread on the table. SailboatsToGo is for fun. We're a family business: My son Jeff did this website. My daughter Sofia appears in many photos. My wife Betty is my marketing coach and another photo model. Brother Dan is my beta tester. Sister Arleigh pitches in with advice and photography services. Our friends also serve as models in the photos you see on our website. Our credit card processing is done over an encrypted connection which stands behind our guarantee of honest dealing and secure credit-card processing. If you need any help with a purchase (before, during, or after) give us a call or shoot us an email.